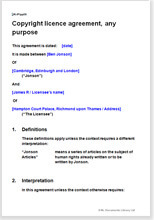 This is a simple licence agreement whereby a creator of original written work or artwork licenses his work to some other person for some specific reason. The work may be a photo image, a carton, a picture, an article or anything else. In the document we have assumed you have agreed to write a series of articles for a newspaper. However, you could as easily have agreed to allow your art to be used on posters and programmes to promote a special event. Maybe a singer wants to use your song. Maybe you want to licence your article to a website owner. This document is written in Australian law but is suitable for use when your counter party is in some other jurisdiction and whatever countries you allow him to cover. If you expect to receive a royalty for commercial exploitation of your copyright work, use Licence to use name and trademark for merchandising in a different field: media or any industry: up front fee or royalty. That is a full version which you can edit easily to refer to your work. That document also covers many more options. Net Lawman offers around 30 licence agreements and assignments relating to intellectual property. Over 9,50 words of helpful drafting notes. "I was getting the contents of my website together for the web designer and was asked to get together terms and conditions and I thought, where on earth do I get those from. I did a search for terms and conditions and came across Net Lawman. It was a simple process and easy to understand. It has saved me time and given me peace of mind."